According to some animal rights groups the grey squirrel is a victim of circumstance. They say it has been made a scapegoat for regional red squirrel population extinctions and claim that loss of the reds is caused entirely coincidentally by habitat change. They suggest the true facts are being hidden and scientific research being intentionally misinterpreted. If so, then this conspiracy must extend to British legal provisions and EU directives both listing the grey squirrel as an invader to be controlled, right? Well, no – put this argument to the test and you'll see that the facts actually do stack up against the grey squirrel. The reality is that, while the grey squirrel is an important part of North American forest ecosystems, since being brought to Europe by the Victorians in 1876, the animal has had severe ecological and economic impacts on British woodlands. Acrobatic and entertaining they may be, but the charge sheet against the grey squirrel is based on hundreds of peer-reviewed research papers. There really is no defence for it. Today there are approximately 2.5m grey squirrels in Britain, but less than 140,000 reds. Grey squirrels out-compete native reds for food and space. They also dig up and consume seed that red squirrels have buried as a winter store. This behaviour reduces red squirrel skeletal growth rates and adult size, and greatly depresses juvenile survival rates too. In addition, greys harbour infections – including squirrel pox, which can devastate red squirrel populations. They elevate local viral and nematode infection rates, and bring in new parasites, such as Strongyloides robustus, which are picked up by red squirrels. Occasionally a healthy red squirrel is found with squirrel pox antibodies – some researchers have suggested that this is evidence of them evolving resistance to the pox. 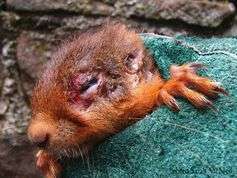 Unfortunately, 63% of red squirrels dying from pox have also been found to have this antibody response present and there is no evidence that these antibodies confer immunity. Even if they did, research has also shown that antibodies are gone within 18 months and, irrespective of any resistance, red populations would be replaced by grey via competition anyway. Grey squirrels also damage and kill forest trees making it impossible for foresters to grow high-grade hardwood. This means such material is imported instead, bringing with it the risk of new tree pests and pathogens. Tree damage is most frequently seen on the branches and trunks of oak, beech and maple; bark is stripped by squirrels eager to consume the the sap underneath. Tree stems break or die following stripping, which in turn leads to changes in the structure and species composition of high canopy in amenity woodlands. Even songbirds are affected by grey squirrels. A recent study gave evidence of negative association between woodland songbird fledging rates and presence of grey squirrels – though it must be noted that this was not observed annually and only seen on some of the sites studied. Earlier studies didn't find evidence to indicate greys affect bird population, but also didn't exclude the possibility – even for bird species whose population is increasing overall. Other animals may be affected by greys too: there has been some suggestion that squirrels compete with dormice for hazel nuts, though more research is needed to confirm the true impact. The Wildlife Trust has recently started to recruit 5,000 volunteers to monitor and control grey squirrel populations. However, a look beyond the headlines will reveal thousands of people are already legally trapping and shooting greys across the country to control their numbers. Volunteer groups cull 6,000 grey squirrels per year in the north of England, for example. Even in areas where reds are absent, locals control grey squirrels to protect woodlands or prevent damage to property. This is not some dramatic new approach by the Wildlife Trust, but is simply reinforcing an established national movement. The eradication of greys from the Welsh isle of Anglesey saw red squirrel numbers increase from 40 to 700 and there are other examples of grey control halting or reversing red squirrel decline. Research has also demonstrated that red squirrels do not prefer conifer to broadleaved habitat and are just as happy in either. Future control may involve giving the squirrels contraception, but will almost certainly not rely solely on this because of logistical barriers. The pine marten may assist in some landscapes too: one Irish study found a strong negative correlation between pine martens and greys in the woodlands studied. However, the use of trapping and shooting will inevitably continue as part of an integrated national approach. And so the grey squirrel stands guilty as charged. Their presence has decimated the British countryside since they were introduced from North America, and if we do not continue to control the species, the future for red squirrels and woodland ecosystems will be bleak.